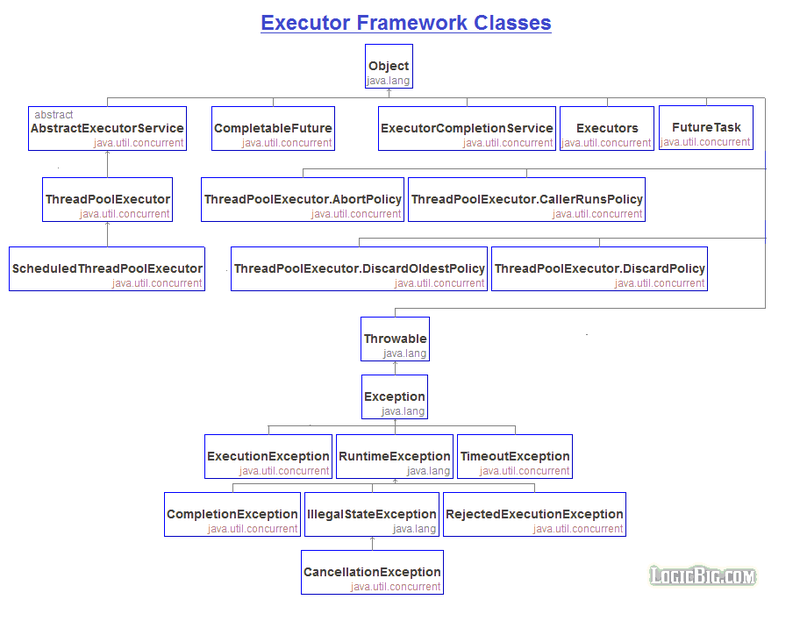 Executor framework is a flexible task dispatching framework. The framework abstracts away thread creation and managing it's lifecycle plus adding some extra thread-management related functionality depending on what type of the "Executor" we use. Instead of learning a lot of theory, let's take a practical approach and see what we can do with it. Here are the part of java.util.concurrent package showing executor framework related artifacts. A sub interface of Executor, which adds features that help manage the lifecycle, both of the individual tasks and of the executor itself. Similar to Executor#execute, the ExecutorService interface defines more versatile submit method. Like execute(), the submit() method accepts Runnable objects, but also accepts Callable objects, which allows the task to return a value and handle exception gracefully. The submit method returns a Future object, which is used to retrieve the Callable returned value and to manage the status of both Callable and Runnable tasks. The ExecutorService provides methods (invokeAll, invokeAny) for submitting large collections of Callable objects. ExecutorService also provides a number of methods for managing service's lifecycle, specifically shutdown of the executor. Based on factory pattern, this class has static methods for creating instances of ExecutorService. We will rarely want to create the service instance by using new operator. It's very uncommon that we have to deal with various implementation of ExecutorService directly as this class abstracts away all implementation details, we just have to work with high level returned interface instances (the main advantage of using factory pattern!). Let's see a quick example. In this example we are going to use Executors#newSingleThreadExecutor method, which is the simplest method to get started. In Executors class, all methods of form newXYZ return an instance of ExecutorService or a sub-interface instance. In above example we submitted a runnable, which is executed asynchronously. The submitted call returns a java.util.concurrent.Future instance. We are not doing anything with it in above example but it's useful in cases where we want to check if the thread is done executing, to get the return value in case if we use java.util.concurrent.Callable as parameter and to cancel the task. The shutdown() call allows the submitted tasks to execute before terminating the service. newCachedThreadPool(..) Creates a cached thread pool's ExecutorService that can create new threads as needed or reused cached thread. newFixedThreadPool(..) Creates a thread pool that reuses a fixed number of threads operating off a shared unbounded queue. newScheduledThreadPool(..) Creates a thread pool that can schedule commands to run after a given delay, or to execute periodically. newSingleThreadExecutor(..) Creates an Executor that uses a single worker thread operating off an unbounded queue. We have already seen an example above. newSingleThreadScheduledExecutor(..) Creates a single-threaded executor that can schedule commands to run after a given delay, or to execute periodically. newWorkStealingPool(..) Creates a work-stealing thread pool using all available processors as its target parallelism level. May use multiple queues to reduce contention.